In order to learn a little more about the weekly Torah portion and to enhance the Shabbat table, I try to make a "parsha treat" every week. Some weeks it's very easy: for Parshas Noach, anything rainbow works. Parshas Ki Teitzei includes the mitzvah of Shliuach Haken - sending the mother bird away from the nest before you take the young birds or eggs (Deuteronomy 22:6-7). We've made birds' nests and eggs out of Chinese noodles and rice cereal (with jelly beans for the eggs) and out of grated potatoes and spaghetti (with mini-meatballs for the eggs). Parshas Baha'aloscha offers a whole meal, as the Israelites complain because they miss the foods they ate in Egypt: meat, fish, cucumbers, melons, leeks, onions, and garlic (Numbers 11:4-5). Other weeks are more challenging, and we sometimes have to look at the commentaries or possibly use a reference from the haftarah. For example, in Parshat Vayeishev, Joseph's borthers cast him into a pit. "The pit was empty, no water was in it." (Genesis 37: 24). Rashi notes that if there was no water in the pit, there were serpents and scorpions in it (Shabbos 22a). The verse and commentary inspired a "Joseph in the Pit Cake:"
I try to make things that are kid-friendly -- both in the preparation and the eating. We often take the very easy way out: whenever the Torah mentions the cloud that accompanied the Israelites as they traveled through the wilderness, we have "Pudding in a Cloud," which is a bowl of whipped cream with chocolate pudding in the middle. 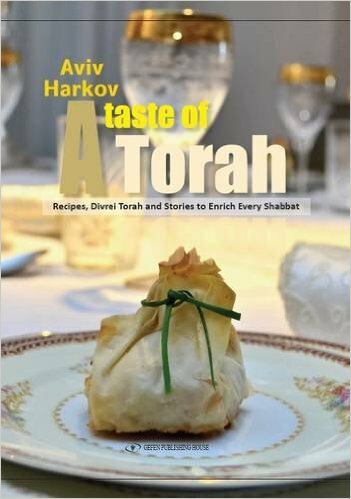 A Taste of Torah by Aviv Harkov (Gefen Publishing, 2016) provides not only recipes, but Divrei Torah and stories. Yes, there is a Chicken and Red Lentil Stew for Parsha Toldot and some Black and White Cookies, symbolizing separation, for Parsha Bereishit. Many of Harkov's recipes are for a more sophisticated palate: Shepherdess Pie made with sweet potatoes and sweet and savory spices (for Parshat Vayetizei, which mentions that Rachel was a shepherdess); Salmon, Asparagus and Roasted Pepper Salad with Sun-Dried Tomato Vinaigrette (for Parshat Shemini, which discusses which fish are kosher); and "Toads in the Hole" for Parshat Shemot. I can't figure how some recipes relate to the Parsha: Thai Chicken with Fried Rice for Parshat Tsav; Deli Roll for Parshat Tetzaveh, but they look very appetizing in the color photographs and will definitely enhance the Shabbat table. 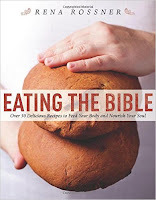 A modified version of the recipes and commentary in Rena Rossner's Eating the Bible (Skyhorse Publishing, 2013) originally appeared in the Jerusalem Post. She started this ambitious project the way many of us do: serving red lentil soup or stew for Parshas Toldot (when Esau sells his birthright to Jacob for "that red red stuff"). "The ability to bring the Bible alive in such a tactile way" motivated her. Rossner's book has more universal appeal, as she refers to "the Bible" and "the Old Testament," and although the recipes correspond to the weekly Torah reading, just the verse or verses that inspired the recipe are noted, not the name of the parsha. As is the current trend in cookbooks, it is not just ingredients and directions. 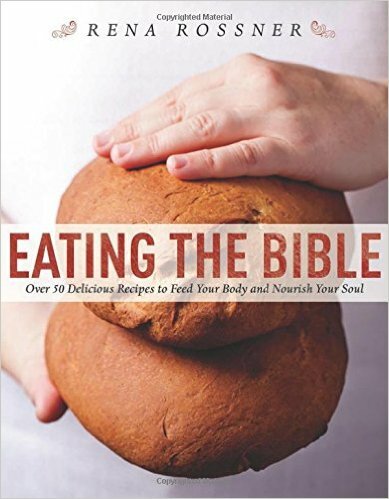 With each recipe is "serious consideration of biblical texts." Rossner also provides alternatives that "provide either child-friendly ideas to make alongside the recipe of jumping-off points for your own recipes. "Simple questions for discussion at the meal are also included. Recipes included Red Lentil Soup, a technicolor salad for the week we read about Joseph's coat of many colors, Woven Tapestry Bread for the week we read about the items made for the Tabernacle, "Cat's Got Your Tongue Cookies" for the parsha that includes the commandment against gossiping, and Cucumber and Melon Gazpacho for Parshas Baha'aloscha, when the Israelites were complaining because they missed all the foods they ate in Egypt. The only week I found puzzling was Parshat Eikev, which specifically mentions wheat, barley, grape, fig, pomegranate, olives and date honey (Deuteronomy 8:7-8), when I make a fruit salad. Rossner chooses the next verse, which mentions that the stones are iron, and opts for a hearty "Iron-Rich Black Bean Soup." 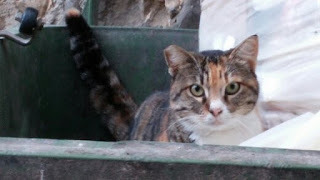 Thank you for posting about "A Taste of Torah". As a NBN rep, I took care of the Harkov family when they made aliyah. I will definitely look for this book. Both books are very good. For Parshat Chayei Sarah, I may make the Broccoli Soup from A TASTE OF TORAH and the Fudge Cave Cake from EATING THE BIBLE.